Emily focuses her practice on capital raising transactions, mergers and acquisitions, securities, and corporate governance. She has a wide array of experience in structuring corporate and financial transactions, most notably representing companies in merger transctions, issuers and underwriters in public and private offerings of debt and equity securities, and financial institutions in lending transactions. 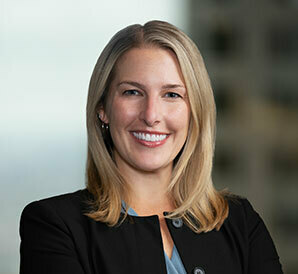 Prior to joining the Firm, Emily practiced in the corporate and securities area of a large Chicago law firm. Represented Northern States Financial Corporation (OTCPINK: NSFC), in entering into a definitive agreement in which Northern States merged with First Midwest Bancorp, Inc. (Nasdaq: FMBI). Represented Heartland Financial USA, Inc. in the sale of its consumer finance subsidiaries Citizens Finance Co. and Citizens Finance of Illinois Co., and the completed sale of their existing loan portfolios to American Credit Acceptance, LLC. Midland States Bancorp, Inc. (Nasdaq: MSBI) Acquires HomeStar Financial Group, Inc. Represented Midland States Bancorp, Inc. (Nasdaq: MSBI) in connection with its definitive agreement to acquire 100% of HomeStar common stock, and its wholly owned subsidiary HomeStar Bank and Financial Services, in exchange for 405,000 shares of Midland common stock and a commitment to provide approximately $23.5 million in debt financing to enable HomeStar to retire outstanding trust preferred securities. Representation of Midland States Bancorp, Inc. (Nasdaq: MSBI) in connection with its acquisition of Centrue Financial Corporation (Nasdaq: CFCB). Representation of Midland States Bancorp, Inc. (Nasdaq: MSBI) in its $80.1M initial public offering of common stock. County Bancorp, Inc. to Acquire Fox River Valley Bancorp, Inc.
Alerus Financial Expands Service Offerings with Acquisition of Alliance Benefit Group North Central States, Inc.